Make arrangements for your pet in your will. Include your dog in your will. Who should care for your dog? What are your wishes for your dog's care? You shouldn't “will” your dog to an organization without checking with them first—many organizations require a fee for this service. And of course, check with family members before you designate them for pet care in a will; be sure they are able, and willing, to care for your dog in a manner that is acceptable to you. Ask your retirement advisor. There are numerous ways, from pet trusts to pet protection agreements, that can keep your pets happy and well taken care of after you are no longer around to do it. Forty-six states (all except Kentucky, Louisiana, Minnesota and Mississippi) have enacted pet trust laws. These laws enable a pet to be the beneficiary of the funds from a trust. Your retirement advisor will have more information regarding the specifics in your state. Create a Pet Trust. With a pet trust, you pick a trustee (this person will manage the money you're funding the trust with) and a caregiver (this person will care for your pet); the trustee disperses funds and/or property to the caregiver who will then use them to care for the pet in the manner you've laid out in the trust. Pet trusts are typically the most expensive as you not only must fund the trust, but also must pay lawyer’s fees that can easily top $1,000. Because trusts are more expensive, both to execute and to maintain, this option works best for people who plan to leave tens of thousands of dollars or more to their pet. For more information visit www.ASPCA.org/PetTrusts. Write out an agreement. If you don't want to set up a pet trust, identify one or more caregivers and write out an agreement that states that this person will care for your pet upon your death or inability to care for your pet yourself. The biggest advantage of this, over a pet trust, is its relative affordability (you don't have to pay an attorney to do this). Make sure you discuss this with the designated person first. You can use a standard form Pet Protection Agreement at www.LegalZoom.com. It costs between $39 and $79 —or you can draft the letter yourself, get it signed by both you and the caregiver, and get it notarized. Make sure that your vet, the caregiver, and your close family members have a copy of this agreement, so they will know who to give your dog to if something happens to you. Continuing Pet Care Programs. Some animal sanctuaries, humane societies, and veterinary schools offer programs to care for your pet in the event you can’t. For example, The North Shore Animal League in New York has a program that guarantees food, shelter and state-of-the-art medical care for your pets until they can be adopted by another family. You pay a one-time fee of $10,000 for your first pet and $5,000 for each additional pet to join the program. To find a program near you, you can do an online search for a "continuing pet care," or ask for a referral from your veterinarian or local humane society. Talk about it. Some people know that their children or family member will take their pet because they have talked it through. While simply talking about the issue doesn’t offer you much in the way of legal protection, it is still better than doing nothing. Remember that there is no guarantee that the caregiver you talk to about this will actually take on the responsibility. So, for a few extra dollars, it might be a good idea to put your wishes in writing. Leave information about your dog. In the case of emergency or sudden illness, make sure family members know where to find the basics: contact information for your veterinarian, any special medications or medical issues, food that your dog eats, favorite toys, and sleeping places. This information can help someone who needs to care for your dog unexpectedly make her much more comfortable, and even avoid a needless medical emergency. You can also check out our free webinar by Amy Shever of 2nd Chance for Pets. 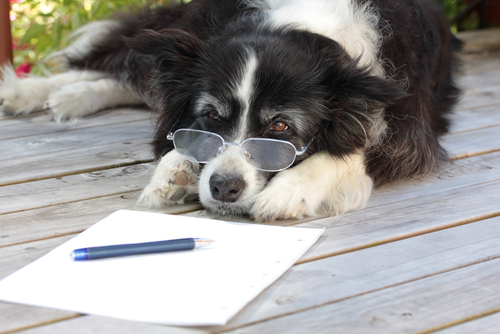 A version of this article can be found in Grey Muzzle's free guide Caring for Your Senior Dog. Caring for Your Senior Dog was developed in collaboration with a leading veterinarian in geriatric medicine, a clinical nutritionist, and other experts in senior dog care. The entire guide is free to download.